Ooh, so CUTE! LOVE the sleigh and that adorable snowman! Looks like he's having a ball! hahaha, Super Cute gift idea! Have a wonderful weekend! 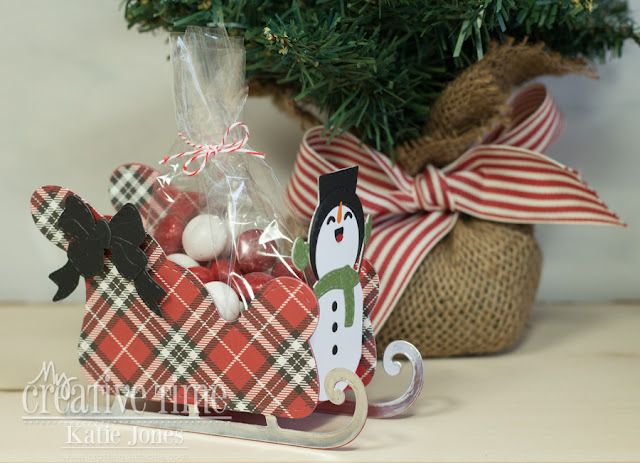 Super cute treat box made with the Sleigh! Your little snowman is super adprbs! Love this sleigh. Such an awesome gift idea. Oh my goodness! Your sleigh and snowman combination have sent my Christmas spirit soaring! Love how 'enthusiastic' your little guy is, spreading joy to all who see him! Two of my favorite things! The sleigh and a snowman! Love this! I really need this sleigh in my stash! I just love it. Love that you can make it a treat holder with the sleigh bed. LOVE the snowman addition, too. OMG, that is so adorable! What a fantastic treat box. A beautiful present that anyone would love to have. OMG Miss Katey Your Sleigh is so Cute!! Love your idea for Frosty to be in charge....I can just picture him dancin' around town with his no horse open sleigh!! Love that Plaid Paper...so Stunning...You did a Super Incredible Creative job!! YOU so ROCK!! how adorabble !!! who would not like that for a cute present!! Haha! Maybe the sleigh was flying too low and hit that snowman...I like it :D So adorable! No matter how he got there, I like the snowman in front of this cute plaid sleigh.